Cyberherbalist's Blog | A retired software developer who blogs occasionally. Don't get trampled in the rush! I just watched the live launch of SpaceX’s second Falcon Heavy mission, this time with an actual commercial payload, Arabsat 6A. And WOW! Both side boosters came down and landed almost simultaneously at Cape Canaveral, and just a few minutes later the center booster managed to successfully land on the unmanned landing platform, “Of Course I Still Love You”! Very nearly dead center, too! I love to watch these things, and it is especially juicy that this successful hi-tech work is being done by a commercial company, and not by some tax-consuming government agency. I suspect that SpaceX may not be profitable yet, but if they keep this up they ought to become so. 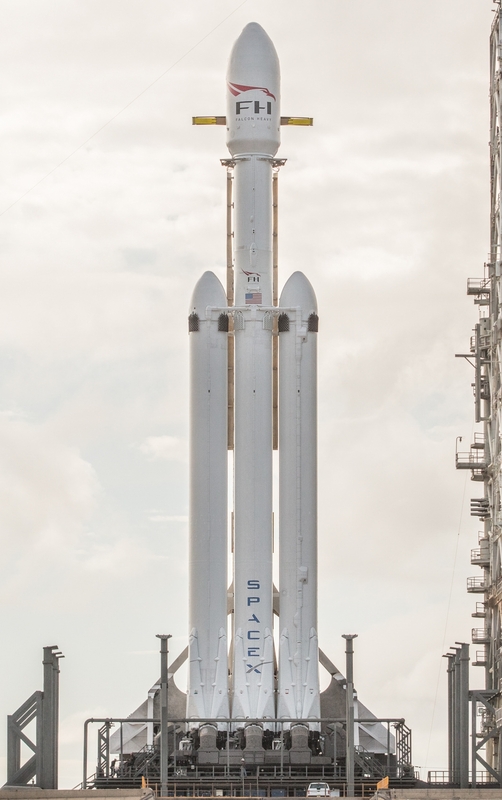 The next SpaceX Falcon Heavy flight is scheduled for June 2019, and the boosters are expected to be the one’s from this flight. Great to get re-use of these expensive items! Sounds like he’s not very comfortable. And I’m OK with that. If he had been involved only with drug smuggling, I’d be a little sympathetic. It’s a business after all, and even if the product is illegal, it isn’t per se immoral. However, by all accounts, Guzmán is also a murderer and torturer of multiple persons. He’d kill his own smugglers even for such minor offenses as being late with a shipment. So when it comes to his confinement in a US prison, I guess I don’t care that he’s not doing well. Some may say that he’s innocent until proven guilty, and of course, that is true, but he’s been convicted of a lot of heinous crimes in his home country and has served time for them. In fact, he isn’t finished serving his time there. I believe that the only reason the Mexican government has allowed him to be extradited to the US to face charges is that they are worried that he would escape from confinement a third time. So if he’s uncomfortable in his New York prison, that’s all well and good. Today is the 4th of July, and in honor of this, I have posted the flag of the United States on my porch. And why would I do this? Because of my love for the country which has done so much good for the world. Yes, I know that the country isn’t perfect, and at all times in its history, it has needed and still needs improvement. But can you name a country of which this couldn’t be said? The fact is, this country has become the greatest country upon the face of the earth, and not because it has sought to conquer other lands, but because it has defended the freedom of all men. Its efforts have not always been successful, and sometimes it has acted incorrectly, but what would the world be like if there had never been a United States? The answer to this is that the world would have been a much worse place. In his inauguration speech in 1961, President John F. Kennedy admonished the citizens of this great country, to “Ask not what your country can do for you – ask what you can do for your country!” For over 150 years my family has been following the principle behind this admonition. My great-great grandfather Christian Frederick Stoltzman (1839-1901) immigrated to this country from Germany around about 1864, settling in Richview, Illinois. This was during the US Civil War, and since he had expressed his intent to become a US citizen this made him subject to call-up for military service. He was subsequently called up for service in the Union Army, as a member of the 8th Illinois Infantry Regiment. He fought in several battles while his regiment was a part of the XVI Corps of the Army of West Mississippi (commanded at the time by Major General Edward Canby), and participated in the last major battle of the Civil War, the Battle of Fort Blakely, Alabama. My great grandfather John Adams Clark (1868-1947) was born in a United States which treated its aboriginal inhabitants, the “Indians”, quite poorly. As a half-white, half-Konkow Indian man, he faced prejudice and some disadvantages as a result. He nevertheless recognized that he was better off here than anywhere else. In 1898, he was working in his occupation as a mineral prospector in California, when he heard that the United States had declared war on Spain (the Spanish-American War). He immediately dropped what he was doing, hiked out of the hills to the nearest place of military enlistment, and signed up. As a private in the 8th California Volunteer Infantry Regiment (Company G), he never faced hostile fire, but he freely put his life into the hands of his country, not for personal advantage but because he loved it. John named his only son, Canby Adams Clark (1901-1942), after U.S. Army General Edward Canby, who was the only US general officer killed during the Indian Wars. When a young man, Canby joined the US Navy and served as a Pharmacist’s Mate for six years during the period between the World Wars, serving aboard numerous ships, including the repair ship USS Vestal. Years after he was honorably discharged from the US Navy, he was working as a well-paid steamfitter when the Japanese attacked Pearl Harbor, an attack which seriously damaged his old ship, the Vestal, which was moored next to the battleship USS Arizona at the time. In the days after Pearl Harbor, the now 40-year old Canby tried to re-enlist in the Navy but was refused due to his age. Being thus unable to serve his country directly, like his father before him he left his occupation and took a lesser paying job as a welder at Todd Shipyards in Long Beach, California, helping to build ships for the US Navy. In May 1942, while engaged in the construction of the USS Ajax, another repair ship, he suffered a heart attack and died. The Ajax went on to serve the United States in the Pacific Ocean during World War II, once even serving alongside Canby’s old ship, the Vestal, during the Marianas campaign. Canby’s only child, Donald Lee Clark (1930-1976), was only 12 when his father died, but his father’s and grandfather’s examples led him to seek to serve his country also – and as soon as he could possibly do so, when he finally convinced his mother to give permission for him to join the US Marine Corps at the tender age of 17. He spent three years of his life as a “Leatherneck”, and his service as a high-speed radio operator (Morse code) saw him sailing with the US Navy’s Sixth Fleet in the Mediterranean Sea. A few years after his honorable discharge in 1950, Donald again served the country in the US Air Force Reserve, again as a radio operator. Donald’s two sons, my brother Mark and I, also followed the flag, myself in the US Army for eight years, and Mark in the US Air Force for ten. The flag in front of my house symbolizes for me the great love which my family has had for this country, and the great blessing which living under its government has been to us. Long may that flag wave over this great land, and long may the freedoms, which that flag symbolizes, endure upon the earth. Wendy and I visited Devonshire over the past weekend, both for me to meet her sister and brother-in-law for the first time, and to have a look at the outstanding natural beauty of that region. It was quite a trip! England is a wonder in and of itself, of course. We spent some of the time driving on highways, of course, but also traveled through the countryside on less-frequented roads. I do have to say that there are picturesque little villages everywhere one turns. And every single one of them are hundreds, if not thousands of years old! We stayed in a nice hotel in Kingsteignton, Devonshire, the Best Western Passage House Hotel. It is a very comfy facility with an excellent breakfast! From there we visited Wendy’s sister and brother-in-law, Sally and Ken, and also Dartmoor! But both the trip to Devon as well as the trip back home were full of adventure! On the way to Kingsteignton we stopped in a few picturesque towns on the Jurassic Coast, namely Lyme Regis, Seaton, and Sidmouth. Sidmouth was particularly impressive due to the red cliffs to its northeast! The name of the city of Kingsteignton is a compound name (commonly-seen in England) that consists of the words King, Teign and the word-ending -ton, meaning “town”. Teign is the name of the river the runs through the town, making this place Teign Town or Teignton, and apparently the town was a regional King’s vill, which would be visited by the King and his court back in the days of the Saxons in the kingdom of Wessex — thus King’s-Teign-ton. Our hotel-room overlooked the Teign estuary (near the mouth of the Teign), which fills with water periodically as the tide comes in and recedes. It was really quite lovely having this in our backyard, so to speak. During the day we could see swans, ducks, and other waterfowl swimming in it. And from time to time in the hotel’s actual backyard we could see a number of wild rabbits enjoying themselves! On the second day we drove out to the edge of Dartmoor and visited Hound Tor. In aid of understanding, a “tor” is a is a large, free-standing rock outcrop that rises abruptly from the surrounding smooth and gentle slopes of a rounded hill summit or ridge crest. Dartmoor has a lot of them. Wendy’s favorite tor out on Dartmoor is Hound Tor. Apparently, Hound Tor helped inspire Sir Arthur Conan Doyle’s Sherlock Holmes novel, The Hound of the Baskervilles. Wendy has visited this tor a number of times, and it is her favorite. So we climbed it of course! Hay Tor has its own visitor center, which was closed by the time we arrived there, since it was nearing dusk. We returned home on the third day of the trip, and on the way we passed through the Isle of Purbeck, visiting the ancient Saxon city of Wareham and Corfe Castle. I should point out that the Isle of Purbeck is not a true island but a peninsula. It is bordered by the English Channel to the south and east, where steep cliffs fall to the sea; and by the marshy lands of the River Frome and Poole Harbour to the north. The wall actually still goes all the way around central old Wareham. On the only side of Wareham not surrounded by the wall, there is the River Frome protecting the eastern side of the town from its enemies! Corfe Castle is an old ruined castle standing above a village, likewise named Corfe Castle. It was the scene of a dastardly murder back in 978 AD, when the English King Edward the Martyr was murdered, possibly at the behest of his step-mother, who wanted to see her own son, Æthelred, take the throne. The castle itself was built many years after the events of 978, and later destroyed by the Parliamentarians during the English Civil War. It’s quite a sight! Unfortunately, the hour was late and we didn’t have time to explore it. We briefly visited the city of Swanage, but our intention to cross the bar of Poole Harbour on the ferry was frustrated by the ferry being out of service due to refitting. Maybe next time! This was a very pleasurable trip, and I got to see a lot of Olde England! I am so very glad this is over. I am so very glad that Hillary Clinton’s political career is over. On the other hand, I am so very disappointed that a more reasonable candidate did not make the cut to be the Republican front-runner and ultimate victor. But give Trump his due! Despite all the naysayers he persevered, and is now the 45th President of the United States. Congratulations, Mr. Trump! Actually, they were whistling past the graveyard on the subject of the GOP’s death. And didn’t notice the gravestone labelled RIP Dems. What is the election doing internationally? Although Trump wants to put stricter immigration rules, he also says he wants to woo Indian entrepreneurs and students to the US. Trump criticised China throughout his campaign, described it as one of the US’s top adversaries. That could make for an advantage to India. He said he would label China a currency manipulator and impose heavy tariffs if China didn’t agree to rewrite trade agreements. He labelled Pakistan as semi-stable and a safe haven f ..
Reuter’s has posted the article, “World in shock as Trump surges to victory in the US“. Germany’s Defense Minister is dismayed and thinks that the Pax Americana is over. Many international leaders are apparently completely flummoxed over what Trump might do. I will confess, I have no clue, either. Suffice it to say, we definitely live in interesting times! It was one year ago today that the life of my beloved Waltraut (known to most of her U.S. friends as “Val”) was celebrated and commemorated at her funeral. The anniversary of her passing was just a few days prior, on 21 September, and I would have written about that, too, except for the fact that I was feverishly preparing for my trip to England to be with Wendy, who became my wife on 3 March 2016. One of the significant facts in my new wife’s family history was that this day marks the second anniversary of her late husband Roger’s passing in 2014. These two events in our lives have turned into formative events, and connect us in ways that I would have been amazed at, had I looked at it from a mere outsider’s point of view. One thing that has proven to be of great comfort to me (and I believe to her as well) is the openness with which we talk to each other about our late spouses. Through this I have grown to appreciate her Roger and to love him as a brother, as I believe she appreciates and loves my Waltraut as a sister. As Latter-day Saints (members of the Church of Jesus Christ of Latter-day Saints or “Mormons”), we believe in the possibility of being sealed for time and all eternity to our spouses. And although I have grown to love Wendy deeply, I know that her eternal companion is her beloved Roger Edmund Knight, as she knows that my eternal companion remains Waltraut Clark. Together we recognize that we are each earthly caretakers for each other’s departed spouse. Yesterday, because it occurred to me that Roger’s headstone had probably been finally installed, I asked Wendy to take me to the little graveyard which has become her family’s place of last rest. And there it was: Roger’s monument – with a space reserved for Wendy when her time comes! 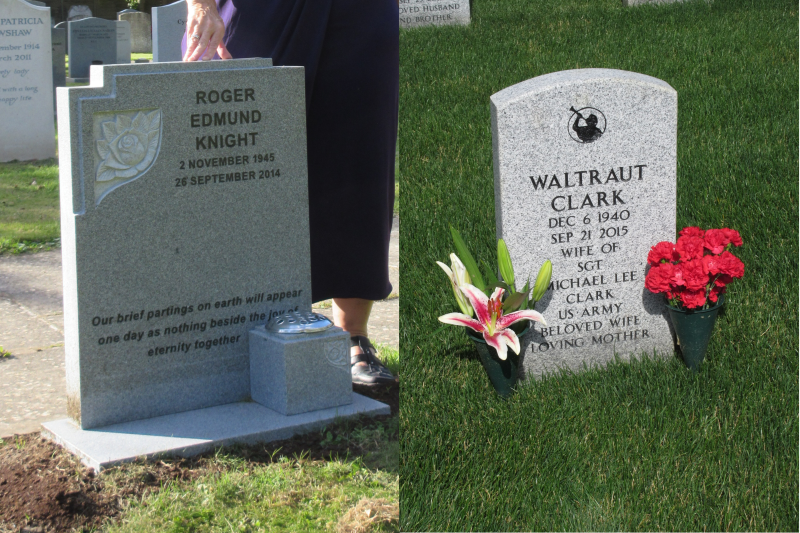 The parallelism gives me great comfort, since my place with Waltraut is already prepared at the Tahoma National Cemetery in Kent, Washington. Now, not to dwell too much upon death, I make it clear that we have decided to avoid arriving at that state for as long as possible! But it is good know that if we should indeed suffer the fate of all humanity, a resting place awaits — one that will serve us until we rise again in the Resurrection – and that it will be a place shared with our beloveds. I am so very grateful to the Lord Jesus Christ for the promise of that Resurrection, a promise which He wrested for us by His own hand from the clutches of Death itself! Wendy and I like to imagine that Roger and Waltraut have become great friends in the Spirit World, as they wait for us to join them, and although there is no religious doctrine to support the notion, we like to imagine also that together they arranged for us to meet and marry. Whether or not this is true (why shouldn’t it be? ), before she died my Waltraut gave me to understand that she expected me to remarry (and as a good husband I tried to accede to her desire, albeit reluctantly at first). In parallel to this, Wendy and Roger each agreed that should one precede the other in death, that the other should seek to find comfort in a second companion. Standing in front of Roger’s grave yesterday, I gave a promise to him that I would take care of his Wendy to the best of my ability as long as I live – something that I have promised the Lord already. It’s a promise I look forward to keeping.